As one of Congress’ chief inquisitors, Jason Chaffetz shot to national prominence using the same playbook that has worked for both parties — he relentlessly investigated the opposition. But with the inauguration of Donald Trump next month, the first time in a decade that Republicans will control all three branches of the federal government, he may need a new playbook. Chaffetz, 49, chairs the House Oversight and Government Reform Committee, a once-sleepy panel that became a political weapon as partisan politics increasingly defined Washington. In recent years, the committee launched explosive investigations into the death of an ambassador in Benghazi, the IRS’ alleged targeting of conservative charities and security concerns over Clinton’s emails. But since the November election, Chaffetz is suddenly lacking a clear target. Many in and out of Congress wonder what he will do next. The first details of the oversight committee’s agenda will be released soon. It will be influenced both by Chaffetz’s political aspirations and the relationship between the congressional GOP leadership and the Trump administration. “He’s emblematic of the larger challenge that Republicans in Congress have as they’re trying to grapple with what a Trump administration means,” said Christopher Karpowitz, co-director of the Center for the Study of Elections and Democracy at Brigham Young University. “He was salivating about the prospect of years of investigations into Hillary Clinton, and now, he’s been essentially silent,” Karpowitz said. Chaffetz’s newfound reticence is all the more striking because of his reputation as a media darling. A former BYU kicker with a full head of tight curls and a knack for public speaking, Chaffetz allowed CNN to chronicle his first year in Congress for a reality show and he was once known for handing out his personal cell phone number to reporters. Chaffetz declined to be interviewed for this story, through a spokeswoman. A full week after the election, Chaffetz responded to speculation about whether Trump’s unexpected victory would prompt him to drop the Clinton investigations. It would not, he told Fox News on Nov. 15. Democrats have called for his committee to look into Trump’s business practices. They also want an inquiry into allegations that Russian hackers were behind the leaks of Democratic National Committee emails during the campaign, as do some prominent Republicans, including Sens. Lindsey Graham and John McCain. For now, Chaffetz isn’t ready to commit. “The clock starts for us when President Trump becomes President Trump,” he told CNN in early December. A few other Republicans on the committee, though, have indicated they would be more willing to pursue Trump, potentially breaking ranks with their chairman. And if a majority of the committee votes to issue a subpoena or hold a hearing, it can override the chairman’s objections. GOP Rep. Justin Amash, a Michigan contrarian, has relentlessly criticized Trump. In a November tweet directed at Trump, he said it would be a “big deal” if Trump had business contracts with foreign governments. And Rep. Will Hurd of Texas said at a Georgetown University forum on Dec. 6 that he took the allegations of Russian hacking seriously. “The [Democratic Congressional Campaign Committee] spent $6 million trying to unseat me — but an attack on them is an attack on all of us, and we can’t let that stand.” he said. Democrats, meanwhile, have dug in, accusing Chaffetz and other Republicans of dropping their guard on Trump. Cummings said that Republicans who have called for greater oversight of Trump understand that ignoring potential conflicts could pose future problems for the party. 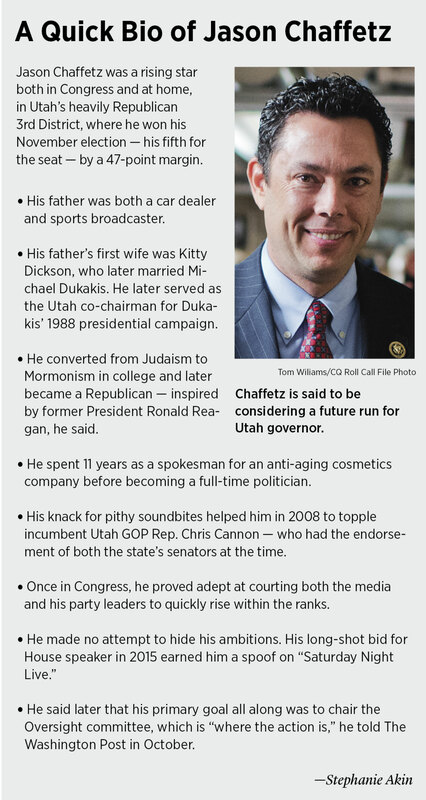 Chaffetz’s political future could also be on the line. He told the Deseret News in January that he would complete his term on as committee chairman, which ends in 2020. After that, he would seriously consider a run for Utah governor. He may need to tread carefully while he’s in Washington. He was among a handful of Republicans to grapple publicly with their response to the release of a video showing Trump making sexually predatory comments about women. And he flip-flopped on his endorsement of Trump in October. Winning a statewide election in Utah could require a more combative relationship with the president-elect. Trump finished last in the GOP presidential primary in Utah and though he carried the Beehive State in the general election, he underperformed previous Republican candidates in the state. Former Rep. Tom Davis, a Virginia Republican who earned praise from both sides of the aisle for his chairmanship of the Oversight committee during the George W. Bush administration, said no one expects the committee to take an aggressive posture toward Trump. Davis said Chaffetz could still distinguish himself by taking on nonpartisan scandals. Davis led investigations into steroids in baseball and government contracts issued to clean up after Hurricane Katrina that had bipartisan backing. Ron Bonjean, a political consultant and former top spokesman to the speaker of the House and the Senate majority leader, said such a strategy would probably lower Chaffetz’s political profile, but it might be the wiser hedge. “Trump has strong political capital going into this Congress and it will be more difficult to safely go after him in an oversight manner, at least right away,” he said. In the scant details Chaffetz has provided so far of his agenda, it appears some of his targets will have similar appeal. He said in December that he planned to look into a Washington Post report that the Pentagon had buried $125 billion in government waste. He told Roll Call that an overhaul of the federal workforce was, “high on our agenda.” That would realize both the long-held aspirations of congressional Republicans and the campaign promises of the president-elect. The Oversight committee has not always been considered a plum assignment. With an official purview that includes post office regulations and Washington, D.C., government — and no appropriating power — it held few enticements for the politically ambitious until the mid-1990s. That’s when Chairman Dan Burton, an Indiana Republican, spearheaded seemingly endless investigations into the Clinton administration, issuing more than 1,000 subpoenas without Democratic consent, a break from committee tradition. Democrats bristled at the strategy. Political scientists note that both parties have used the committee’s powers more aggressively — holding more hearing days and issuing more subpoenas — when an opposing party is in the White House. Chaffetz’s promised to return the committee to its stodgier roots when he took the post in 2015. He said he would open more investigations into the post office. Democratic staffers who have worked on the committee said privately that Chaffetz was initially more conciliatory than his predecessor, California Republican Rep. Darrell Issa. He made a point of taking on bipartisan investigations, including inquiries of the Secret Service and rising drug prices — a signature issue for Cummings, the committee’s ranking member. But Democrats saw Chaffetz’s investigations of Hillary Clinton while she was campaigning as a dangerous precedent.